Mix yoghurt with little water,beat for 2-3 minutes. Mix it with soozi. The batter of yoghurt and soozi should be to the consitency of neither too thin nor too thick. Meanwhile mix finely chopped onions, green chilis with little salt and red chili powder. Pour 1 tbsp of soozi batter into the idli maker stand. Now put some onion mixture on the batter and again cover this onion mixture with one more tbsp of soozi batter. Keep your idli stand on high for 6-7 minutes(on gas stove).Idlis are ready. Boil dal with little salt, turmeric powder and ghee for 6-7 pressures. Dry roast chana dal, cumin seeds, coriander seeds, mustard seeds, peppercorns, red Chilis, and rice on a low for 8-10 minutes. Take care that the spices do not burn. Transfer above ingredients to a bowl. In the above pan heat oil. Add garlic cloves and ginger. Fry for 1-2 minutes. Then add grated coconut and half of the above mentioned tomatoes. Fry for 1-2 minutes and transfer them to the bowl containing spices. Let it cool for few minutes. Transfer above ingredients to a grinder and process to a fine paste by adding required amount of water. Heat oil in a large pan. Add cumin seeds. When they start to crackle, add onions and turmeric powder. Cook for 1-2 minutes. Then add curry leaves, green chillies, mix vegetables and cauliflower florets. Cook for 1-2 minute. Then add red chilli powder, rest of the tomatoes, tamarind juice/soya sauce and water. Let water comes to a boil,then add prepared sambhar masala. Cook for 6-7 minutes. Then add mashed boiled dal and 3-4 cups of water. Let it boil for 15-20 minutes on medium flame. Add freshly chopped cilantro.The consistency of sambhar should not be thick at all. Thanks for sharing this recipe.... Looks good! I will try to make it. 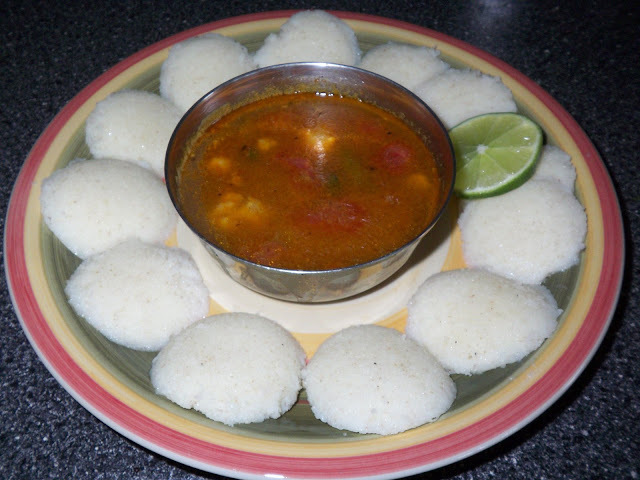 Hey, Just curious about idli color, the idlies are looking white. What rave did you use? For idlis i use the Coarse Soozi of 'Swad Brand' available in most of the Indian Stores here in US.